HI MOMMY, RUDY SAID HE'LL BUY ME A DWARF RABBIT FOR MY BIRTHDAY IF I WANT ONE. CAN? I CUT OUT PAPER GRASS TO STICK ALONG THE WALLS!!! I was kidding about the bunny (or not). We happened to be at Kallang Leisure Park (exploring unchartered territories!) and passed the pet shop, where I attempted to convince Rudy that Marley needs a deluxe cage with all the fancy tunnels, lookout posts and stuff. In reality she is actually highly undeserving as despite me housing, feeding and clothing (non-literal) her, she remains stubbornly hostile. 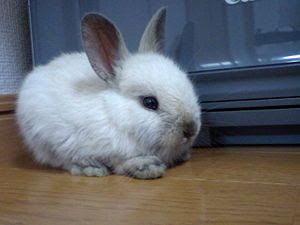 Anyway, I voiced that I wouldn't mind a bunny- far cuter than the recently-in-trend (such is the power of Perez Hilton's Twitters...) jerboas (UGLY) although some would, I quote, "willingly hand over my firstborn to a tribe of cannibals for one" haha. 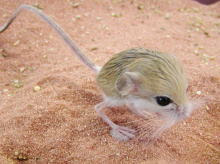 Jerboa. Actually it'd be quite cute if not for the freaky legs. It looks like a mouse-chick hybrid. I was considering a bunny not really for the immediate future, more like after I'm suitably settled down in NUS and altogether maybe when Marley has passed on (approx. lifespan of 2 years), but Rudy jumped at the idea. Visibly thinking up birthday gift ideas is not his forte. So there you go, a laboriously long and futile explanation on the sudden bunny-interest. 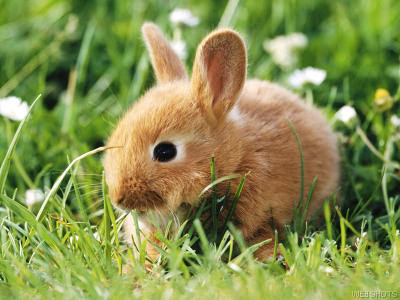 After Googling the bunny photos, I do kind of want one now so kY00t. Fret not; I am responsible and etc (leaves a lot of room for leeway here haha), had a bunny before! MOMMY, BUNNY PLZ. I'LL EVEN THROW PAPER CUT-OUT FLOWERS INTO THE DEAL, I PROMISE!!! P.S. If you like ribs (and can eat a lot of them), Hard Rock is having a promotion now. $29 for all-you-can-eat ribs! Aka Ribs Refilled/Ribs Free Flow. P.P.S. No sharing. I do hope no one is cheapskate $_$ enough to want to order one ribs promotion for a table of like, 5.